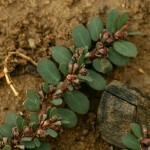 Purple-tinged, prostrate, much-branched annual herb. Leaves small, ovate; margins obscurely dentate. Flowers terminal or on short axillary shoots, purple-pink, sexes separate on the same plant. Habitat: A common and widespread weed of gardens, roadsides and disturbed areas. Worldwide distribution: Native to the West Indies but now a pantropical and subtropical weed. Carter, S. & Leach, L.C. (2001). Euphorbiaceae: subfamily Euphorbioideae: tribe Euphorbieae Flora Zambesiaca 9(5) Pages 357 - 358. Da Silva, M.C., Izidine, S. & Amude, A.B. (2004). A preliminary checklist of the vascular plants of Mozambique. Southern African Botanical Diversity Network Report No. 30 Sabonet, Pretoria Page 149. Wild, H. (undated, c. 1955). Common Rhodesian Weeds ?Government of Rhodesia, Salisbury Page 47. (Includes a picture). Hyde, M.A., Wursten, B.T., Ballings, P. & Coates Palgrave, M. (2019). Flora of Mozambique: Species information: Euphorbia prostrata.